Last week I saw a patient with PPMS (>55 years of age). He has had symptomatic disease ~15 years and is using a stick for outdoor mobility. He has a dropped left foot that gets worse when he is tired and as a result has had several falls. Fortunately, he has had no fractures. Other problems included sexual dysfunction, urinary hesitancy, urgency, urgency incontinence and nocturia, constipation, back pain, restless legs and nocturnal leg spasms, poor sleep, fatigue, low mood and the ubiquitous anxiety about the future. He has previously been part of the fingolimod in PPMS study, but doesn’t feel fingolimod helped. His walking had continue to deteriorate. His latest MRI showed several spinal cord, cerebellar, pontine and brain lesions. There was gross spinal cord and cerebral atrophy. None of the lesions enhanced after the administration of gadolinium (contrast agent), indicating that none of the lesions were active. His recent cerebrospinal fluid analysis showed OCBs and a raised CSF neurofilament light chain level (1050 ng/ml; ~ double the upper limit of normal for his age). What should I do for this patient? He has been following our blog for years and wanted something active done about his MS. He had read the literature and was keen to have something done about his disease progression. He was dissatisfied with his current neurologist’s attitude who had said there is ‘nothing to be done about your disease at present’. He has taken things into his own hands and had ordered high-dose biotin from a US-based compounding pharmacist, but has not noticed a response. After reading around he is keen to go onto low dose methotrexate; his was particularly concerned about losing arm and hand function and is convinced that our group are right about our length-dependent axonopathy hypothesis. Should I listen to him and prescribe him off-label methotrexate or not? Should I say no and ask him to wait for ocrelizumab? Please note there is no guarantee that ocrelizumab will be licensed by the EMA for PPMS and not guarantee that it will be green-lighted by NICE. In addition, he is over 55, has an EDSS of 6.0 and no active lesions on MRI; this may be important as I suspect the EMA/NICE will want to define a subgroup of people with PPMS who are more likely to respond to ocrelizumab (for example, young (less than 50/55), less disabled (EDSS <=5.5), with active, or Gd-enhancing, lesions on MRI). Should I put him on a waiting list for upcoming clinical trials? Methotrexate was effective, compared to placebo, in delaying loss of upper limb function as assessed using the the 9-hole peg test and the box-and-block outcome measures. Methotrexate was not effective in slowing down loss of lower limb function as assessed using the EDSS and ambulation index over 2-years. Goodkin et al. 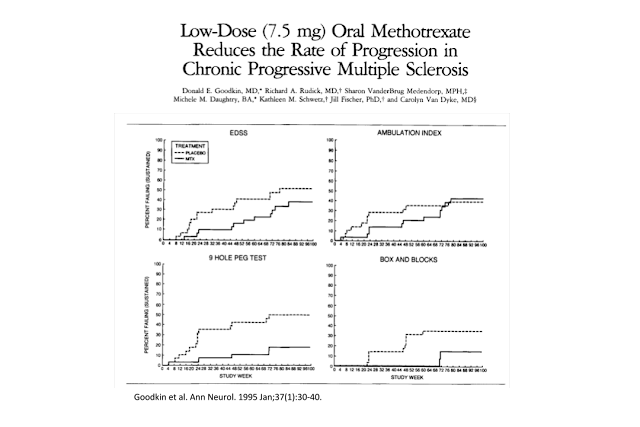 Low-dose (7.5 mg) oral methotrexate reduces the rate of progression in chronic progressive multiple sclerosis. Ann Neurol. 1995 Jan;37(1):30-40. Introduction and Methods: A randomized, double-blinded, placebo-controlled, clinical trial of low-dose, weekly, oral methotrexate was performed in 60 patients with clinically definite chronic progressive multiple sclerosis (MS) attending a referral-based outpatient MS clinic. Study patients were 21 to 60 years old with a disease duration of longer than 1 year. Patients’ Expanded Disability Status Scale scores were 3.0 to 6.5 (ambulatory with moderate disability). Patients were first stratified by Expanded Disability Status Scale scores, 3.0 to 5.5 and 6.0 to 6.5, and then were randomized to receive methotrexate or placebo treatment. Treatment consisted of weekly, oral, low-dose (7.5 mg) methotrexate or identical placebo for 2 years, followed by observation for as long as 1 year. Results: A composite outcome measurement instrument was used and consisted of (1) Expanded Disability Status Scale, (2) ambulation index, (3) Box and Block Test, and (4) 9-Hole Peg Test. Failure of therapy was indicated by a designated change that was sustained for more than 2 months in one or more components of this composite measure. Significantly less progression of impairment as measured by validated tests of upper-extremity function was observed in the methotrexate treatment group in the absence of clinically significant toxicity. Conclusions: We conclude that low-dose, weekly, oral methotrexate offers a new, relatively nontoxic treatment option for patients with chronic progressive MS.
Goodkin's article was published over 20 years ago…. since then, how often has Methotrexate been prescribed off-label for MS in the UK? Re; "…. how often has Methotrexate been prescribed off-label for MS in the UK?" Interestingly, when I worked at Queen Square we tried it on two VIP patients. Both these patients were from medical families and were doing it under pressure from their parents. I haven't routinely prescribed it. I think we have better drugs now; drugs that have an intrathecal response and may work against plasma cells and B cells within the brain and spinal cord. I am aware that many US-based neurologists have been using methotrexate for years. We have a lot of experience using it in neurosarcoidosis; another off-label indication. Re: "Goodkin's article was published over 20 years ago…. " Medical practitioners and researchers often have very short memories and we end-up re-inventing the wheel. Please note the length-dependent central axonopathy hypothesis to explain advanced MS was proposed by Kurtzke in the 60's and then in the 90's by Bob Herndon. We simply rediscovered it and it explains a lot, i.e. therapeutic lag and the asynchronous progressive MS hypothesis. It also challenges MS being a 2-staged disease. All this is good news as it opens new potential treatments for people with more advanced MS.
Search "Methotrexate" on the MS Society (UK) website and… nothing. Methotrexate is a chemotherapy drug that inhibits the immune system. It has been shown to reduce relapse rates in people with relapsing remitting MS."
Unbelievable. Clearly the MS Society is not even aware of Goodkin's paper. MS Society website isn't great. The MS Trust have a good entry in their A to Z. Have tried to post a link to a 2010 paper in comment below but don't know if it has worked! As a still working 72-year-old physician with a 52 year history of MS (probably SPMS) and an EDSS of 6.0 the question presented has a certain resonance for me. I have taken biotin, Lipitor and fluoxetine. Because of a comorbidity in the past of psoriatic arthritis I was on methotrexate and prednisone for about eight years. I remain unconvinced that Biotin or any of these off-label regimens have been useful . Physical and cognitive exercises and the love of a forbearing spouse (a constant inspiration) are better. Try a fourth time to post! I am exactly as this gentleman. PPMS, 55 yrs of age, dropfoot, stick for outdoor mobility, EDSS of 6-6.5, urinary urgency and hesitancy, was even on the same fingolimod trial! At my last annual neuro appt, I was told there was nothing for me at present. At my next annual appt, in January, no doubt I'll be told there'll be nothing for me in future as well as Ocrelizumab is for younger pwMS! Not sure it's entirely worth turning up as they move my toes up and down, tell me I have MS, smile nicely and say 'see you next year' when I'll be even further away from access to a posssible drug! Re: "I am exactly as this gentleman…"
You need to understand that ocrelizumab results have challenged the dogma and it will take time for neurologists come around to the facts that PPMS is a modifiable disease and probably has been so for decades. We simply looking at the data incorrectly. I'm sorry, but I continue to not understand how the Ocrelizumab trials have changed the dogma regarding PPMS, other than reinforcing what we already knew from the nearly decade-old Rituxan PPMS trials. While it is encouraging that there appears to be a subgroup of PPMS patients on whom these anti-CD20 drugs will be moderately effective (namely, younger, less disabled, and with enhancing lesions), this population represents only about 15% of the greater PPMS population. The other 85% don't appear to be very likely to see benefit from this drug it all. The Ocrelizumab trials were clearly frontloaded with patients who were likely to be responders, based on the information gleaned from the previous Rituxan trials. Strangely, the trial was statistically underpowered to prove or disprove efficacy in patients without enhancing lesions. I hate to read nefarious intent where there may have been none, but this seems like a gross oversight, and more likely a conscious decision on the part of the drug manufacturer to muddy the waters when it comes to getting the drug approved. I've not seen any reason to believe that Ocrelizumab will be any more or less effective than Rituxamab in treating PPMS, and Rituxamab would appear to have a much friendlier safety profile. It's clear that the only reason Ocrelizumab was developed was because Rituxamab was due to soon come off patent, a decision which very nearly blew up in the drug company's face when Ocrelizumab's lupus and Crohn's trials were halted because of patient deaths. The MS trials proved to be a saving grace, but only because it was deemed that MS patients have a higher tolerance of risk due to the morbid nature of the disease. My neurologist and the others in his practice routinely use Rituxamab to treat PPMS patients, with a rate of success of just about what you would expect given the statistics that have been accrued in both anti-CD20 PPMS drug trials. These doctors seem quite disgruntled with the fact that Ocrelizumab is seeing so much hype, when Rituxan is already available (albeit, off label) and may be a safer agent. Granted, any progress in the battle against PPMS is to be heralded, but Ocrelizumab appears, to me at least, to be shrouded in all sorts of reasons for concern, from its very reason for being developed to a potentially frightening side effect profile to what appears to be cleverly manipulated trial data on its effectiveness. As a person with likely PPMS myself, I yearn for the day when real reason for hope is provided to us by the drug companies and/or other researchers. At best, Ocrelizumab seems a small incremental step, and one that merely replicates the efficacy of an already existing drug. TWK our group thinks ocrelizumab is working via targeting memory B cells infected with EBV. Yes, very interesting and potentially very important hypothesis. If true, could also be the mechanism of action for Lemtrada and HSCT, in which case a very big sledgehammer is being used to obliterate a very specific target. Do you know of any EBV specific vaccines or other compounds that may be in the works? To my knowledge, none of the existing antivirals are very effective against Epstein-Barr. Progress on a vaccine for EBV is very slow, which may reflect the fact it has diferent antigens during the phase of infection. It may also lack impetus. It would also take 30 years or so to show that a vaccine giving complete protection against EBV infection reduces the incidence of MS.
"…in which case a very big sledgehammer is being used to obliterate a very specific target. Do you know of any EBV specific vaccines or other compounds that may be in the works?" In my humble opinion as a pwppms, this is _the_ most important observation + question pertaining to MS research ever! Professor Giovannoni and all on the Charcot project – you are the hope. "It would also take 30 years or so to show that a vaccine giving complete protection against EBV infection reduces the incidence of MS."
Hope dashed! Oh well, something for those as yet unborn. I think the raised neurofilament (NFL) levels are the clue to treating this patient. CSF neurofilament levels are rapidly emerging as a responsive biomarker in MS; if we can reduce NFL levels with a treatment then we are impacting on the biology of the disease. The methotrexate treatment I am referring to in this case is not intrathecal methotrexate, but low-dose oral methotrexate. I always look to the UK MS Trust first as a source of information – more reliable and less biased than this site, sorry to say that, but that's how it is. "Methotrexate was well tolerated at the low doses used in the research. Longer-term use may be associated with serious side effects, including lung and liver problems, and the suppression of bone marrow. As a result, methotrexate is not a first line treatment for multiple sclerosis." In fact there are no licensed treatments for PPMS. Rein your attitude in – it's uncalled for. The calibre of some of the interaction on this site is another reason I will be visiting it a lot less in 2017. My point is actually that I find the MS Trust provide the best, fullest, non-biased information. And, by the way – I know better than most that there is nothing for PPMS. I have it. Apologies, sometimes we let comments through that shouldn't get through. We agree that the MS Trust provides the best and fullest information. It is very worrying that since the end of the risk-sharing scheme the MS Trust is in a precarious position financially. We all need to do our bit to help it fund raise and keep doing what it does so well. This site is extremely valuable, immensely so – I didn't mean to criticise it as such. It's just that the MS Trust do such an amazing job in providing reviews of all the scientific information available, and at times when I have felt totally at a loss, they answered all my questions in a very sensitive way. The more access to information the better. Hope you'll be back in 2017. Since this post I have inundated with email asking me to prescribe LDM (low-dose methotrexate) for PPMS. I only did this for a handful of patients when I worked for Professor Ian. W. McDonald. I have not prescribed LDM for over 15 years for MS. In pw-PPMS we tend to prescribe off-label cladribine to those with active disease, i.e. Gd-positive lesions and/or raised NFL levels. I have recently come to know the case of a patient which suffered from untreatable eczema. Several smart dermatologists couldn’t help with all their evidence-based medicine, but simple turmeric did the job, can you believe this? Well, if curcuma penetrates through the brain-blood barrier, which it apparently does, are you really sure that plain curcuma will not do a better job than low-dose chemo? Please do not drift away from this thought by asking for placebo-controlled, randomized phase-III trial results. You know that clinical trials with turmeric on a scientifically sufficient scale is not possible because of the way things work. Gavin, Hi, I'm an MS Nurse, and until reading this I did not know that it was possible to get any treatment at all for pw PPMS other than symptomatic treatment, unless recruited onto trials. If pw PPMS seem to be progressing quite fast, and I'm worried about them, can I just refer, or do I need to show active disease, in which case how do I go about requesting the right investigations? Do you have any guidelines for this, as there could be quite a lot of resistance to agreeing to investigations from GPs? And have I missed anything that's possible for SPMS?